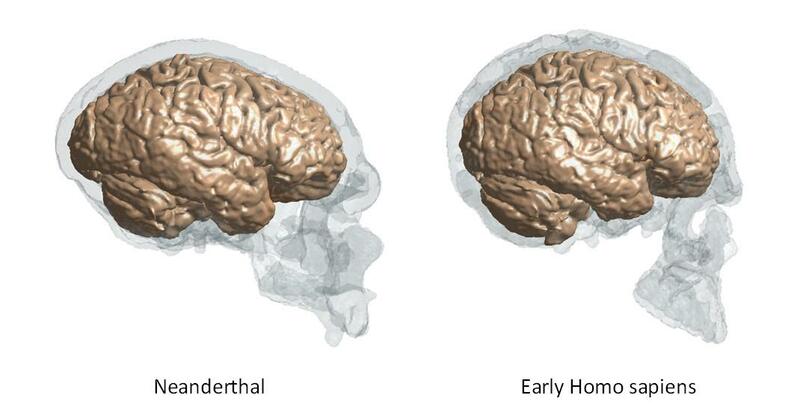 Reconstructed brains of Neanderthals based on fossil skulls compared with those of early Homo sapiens. Why Neanderthals (Homo neanderthalensis), a subspecies of archaic humans that lived until at least 38,000 years ago, were ultimately replaced by modern humans (Homo sapiens) remains unclear. Various hypotheses have been put forward, but a growing amount of evidence suggests that the replacement may have come from differences in neural or cognitive function ― in other words, from brain differences between the two species. Now, Naomichi Ogihara from Keio University and colleagues have virtually reconstructed the brains of Neanderthals and early Homo sapiens, revealing variations in brain morphology that correspond to different social and cognitive abilities. The researchers started from four adult Neanderthal and four adult early Homo sapiens fossil skulls, including the well-known 30000-year old Cro-Magnon 1 skull. Importantly, most of the skulls stem from an epoch during which the two species coexisted. Ogihara and colleagues used an algorithm to reconstruct the brain morphologies from computer tomography data of the skulls ― a technique called computational anatomy. The algorithm was developed and tested through comparing the skulls of living humans to their brain structures. From the obtained morphologies, the scientists derived important parameters such as cerebral and cerebellar volume, and surface morphology. The cerebrum is the largest division of the brain and is divided into two hemispheres. The cerebellum, another part of the brain, lies in the hindbrain and two of its functions are regulation of body movement (motor control) and higher cognition (including language and social abilities). Ogihara and colleagues found that the cerebellum was significantly larger for the early Homo sapiens than for Homo neanderthalensis. Specifically, they found that the right cerebellar hemisphere of Neanderthal brains are relatively small, implying minimal connection to that part of the cerebrum which plays a major role in language processing. Since more data concerning this connection is needed to make conclusions regarding Neanderthal brain function, and since preservation in the cerebellar region of the fossil skulls is not optimal, the researchers point out that the morphology "of the Neanderthal cerebellum needs to be confirmed in future studies with a large number of cases". To examine the relation between cerebellar size and cognitive abilities in more detail, the researchers looked at large sets of data correlating (present-day) human brain morphology and cognitive performance. They concluded that the cerebellar regions are indeed involved in the so-called executive functions (cognitive processes required for the control of behaviour), as well as language processing and episodic memory. The findings of Ogihara and colleagues show that the differences in the cerebellum's neuroanatomical organization may have caused different cognitive and social abilities of Neanderthals and European early modern humans. Citing the researchers, the "ability to adapt to changing environment by creating innovation may have been limited in Neanderthals and this difference possibly affected their chance of survival and drove the replacement process [of Homo neanderthalensis by Homo sapiens]". Naomichi Ogihara received his B.S. in Mechanical Engineering in 1995, and M.S. 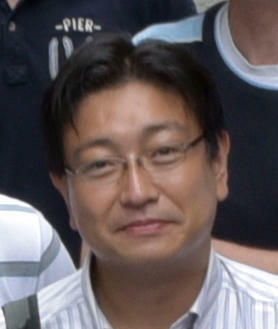 and Ph.D. in Biomedical Engineering in 1997 and 2000, respectively, from Keio University. From 2000 to 2009 he was an assistant professor at the Department of Zoology, Kyoto University and joined the Department of Mechanical Engineering, Keio University in 2009. His research interests cover biomechanics and motor control of complex human and animal movements. Specific aims are to clarify mechanisms underlying adaptive motor behaviour due to dynamic interactions among musculoskeletal system, nervous system and environment, and the emergence of such adaptive motor behaviour through the process of evolution, particularly in humans and non-human primates.